HONING HANDS-ON SKILLS: Kalenik is taking full advantage of Loyola’s experiential learning opportunities. He has served as a judicial extern in the Circuit Court of Cook County’s Chancery Division and is currently enrolled in Federal Litigation Practice, under the supervision of the Honorable Virginia M. Kendall of the U.S. District Court of Northern Illinois. 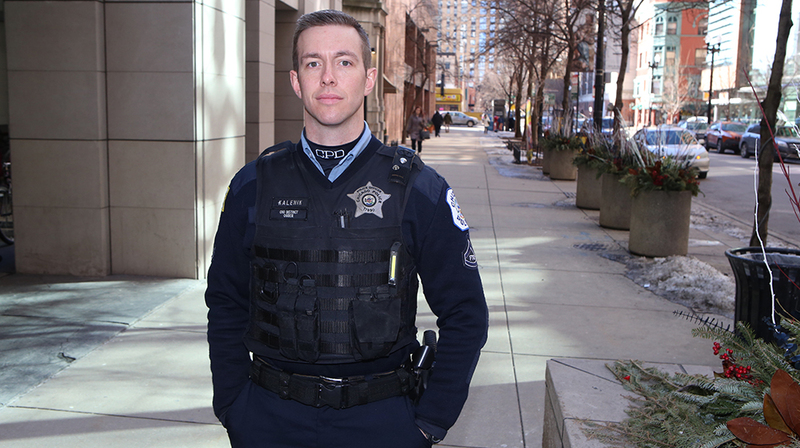 NEXT STEPS: After graduation, Kalenik will enter Officer Candidate School in the Illinois National Guard and continued serving the Chicago Police Department as a Field Training Officer, responsible for instilling a sense of justice in Chicago’s newest police officers. “I will use my legal education to advocate for policies that make our families safer, while embodying the authentic leadership that Chicago desperately needs. As we all know, actions speak louder than words,” he says. This entry was posted in Academic, Experiential Learning, Externships, Financial Aid, Life at Loyola, Living in Chicago, Public Interest, Student Life, Student Spotlight, Why Loyola?. Bookmark the permalink.